if you have followed the system to sell off at HK$53 in Nov 2014, you will have escaped a big downfall as the stock crashed from 53 to 24 over the past half a year. 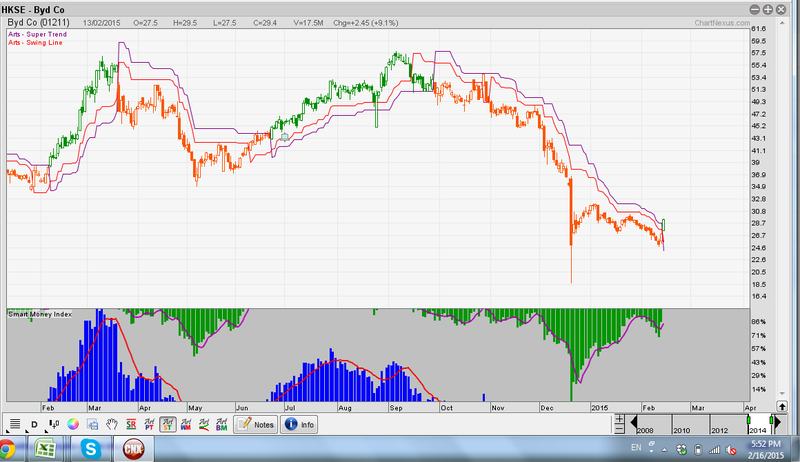 Now we see the system has changed from orange to green, it indicates the trend is changed from bearish to bullish. Below is a finance news of BYD COMPANY from AAStocks Financial News for your reference. BYD COMPANY (01211.HK) announced the disposal of its electronic components business for RMB2.3 billion and the company expected to bring asset increment effect of RMB1.63 billion from the deal, Credit Suisse mentioned in a report. The research house took a positive view towards the transaction given the fair valuation, good disposal timing, and the increasing competition of the flexible circuit boards, liquid crystal display panels and modules, camera products industry. The broker has raised BYD's target price from $71 to $72, with rating reiterated at Outperform.